What a year it has been. 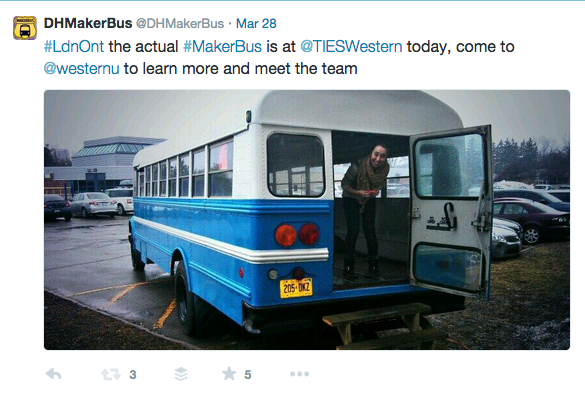 While the MakerBus as a project is turning two in March, 2014 was the year that we really came into our own. In January of last year we had a rusty, barely working school bus with minimal equipment and one year later we’re proud to have a beautiful blue bus filled with tablets, art supplies, a 3D printer, and a drone. Let’s look at 2014 month-by-month and reflect on how the project evolved. In January we kicked off our restoration of the MakerBus with the help of Paul Graham and his shop Alpine Systems Engineering. 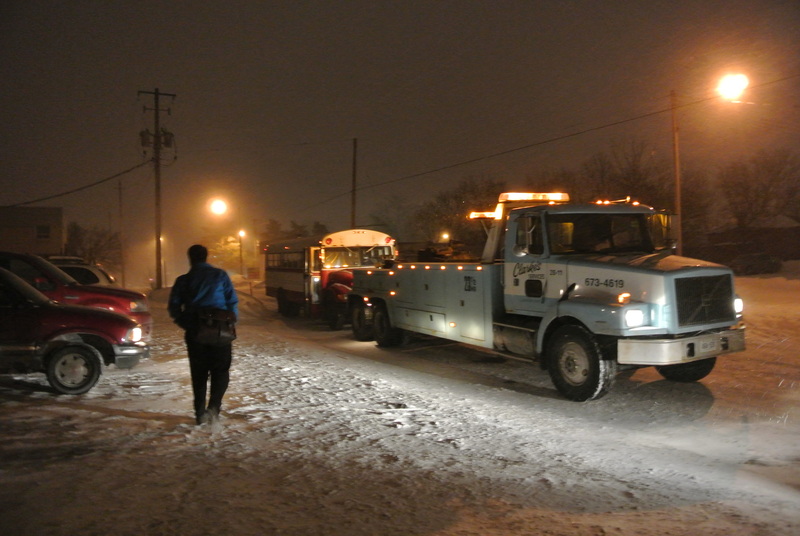 In a wise decision we decided to move the bus to Paul’s shop on one of the coldest days of the year, causing the bus to stall on the side of the highway, needing to be towed the rest of the way. While the restoration got underway, the MakerBus team began planning our most ambitious event yet – the MAKE London Wearable Technology and Made Clothing Fashion Show. Working with Museum London, we envisioned an event that blended tech with art and brought together some of the regions most creative fashionistas. Our call for submissions went out January 31st. We spent a lot of time in Paul’s shop in February. While Beth, Kim, and Ryan were busy working on our various graduate degrees, we were spending pretty much every free hour sanding, stripping, and restoring the MakerBus. We were extremely touched when a number of our community supporters (and a number of Paul’s staff) volunteered their weekend to help make a big push on the renovations. We made a time-lapse of the day. At the same time, one of our community partners Literacy Link South Central received a grant that allowed them to hire two new staff that could work alongside us to learn more about how the maker ethos could be applied to adult literacy education. 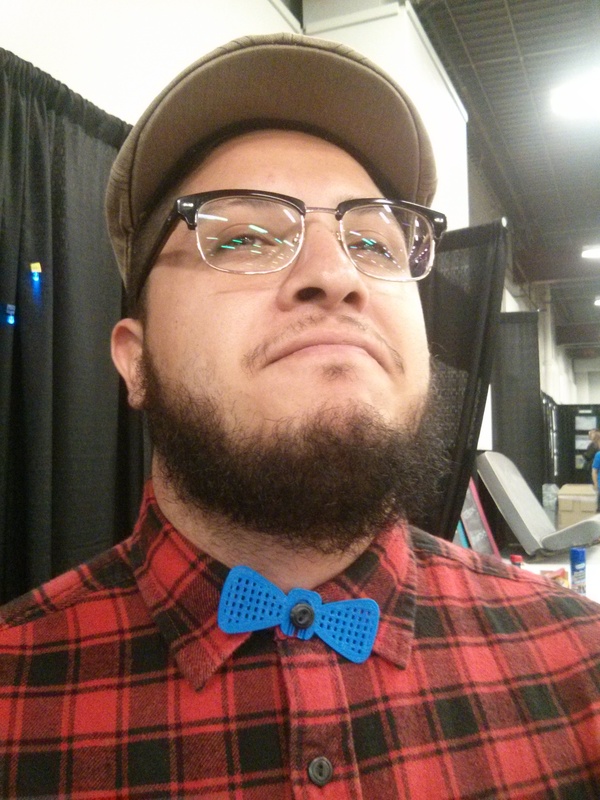 Tony and Danielle quickly became part of the MakerBus family and were an amazing addition to our team. Also in February MakerBus team member James assembled and customized our drone (dubbed “The London Eye”). Working with Literacy Link and the Thames Valley District School Board, James helped design a course in which adult learning with literacy barriers learned to build and pilot their own drone. This course was the first of its kind in Canada, and we’re happy to announce that it is going to run again in 2015. March was one intense month. During this month we finished the exterior renovations on the MakerBus, brought the bus to its first event, planned the MAKE London Fashion Show, finished a crowd-funding campaign for a new project, ran the fashion show, and held an all-day live stream in California. The MakerBus was invited to participate in Western University’s Technology in Education Symposium (TIES). The organizers wanted the bus to be part of their educational “sandbox.” With hours to spare before the conference started, Paul and his amazing team put the final touches on making the MakerBus road-worthy and drove it up to campus. The interior of the bus was little more than an empty space with a projection screen, but for us this was a huge milestone. During this time we also started a spin-off project from the MakerBus. Kim, Beth, and Ryan are all passionate about the humanities and believe that an arts education offers considerable value. Working in partnership with Alex GIl from Columbia University and the 4Humanities network, we launched a Kickstarter for a new project – a cross-continent tour that would interview people about the importance of the humanities to produce a documentary examining the role of the humanities in the 21st Century. We received a huge amount of support for our project and raised $10,000 on our Kickstarter. Sadly we were $5000 short in our funding goal so the Humanities Matter Tour and Web Series has been put on hiatus – stayed tuned for future updates! The MAKE London Fashion Show was a resounding success. We had nearly 200 people from around Southern Ontario come to Museum London to see our 16 designers. After the event Museum London informed us that we set a record for pre-sale tickets for a Third Thursday event and had the second highest attendance for an evening event. The morning after the fashion show Ryan left for California to attend the National Council for Public Humanities 2014 Conference. At the conference Ryan was asked to run an all-day live stream and conduct interviews for the Humanities Matter Webseries – these videos can be seen on our Youtube channel. After an extremely busy March, the MakerBus team had a somewhat quieter April. We focused on continuing our restorations of the MakerBus and began to work on the interior renovations. Even makers need some down time. May was a fun month featuring two big events – the TD Canada Forest of Reading and the Congress of the Social Sciences and Humanities. Each year TD Canada sponsors a summer reading program – the theme in 2014 was “Eureka!” The Western Fair, on behalf of the London Public Library, sponsored the MakerBus to run a number of events around London as part of the Summer Reading Program. Our first event was the Forest of Reading. If memory serves, there were 300 children in attendance at this event. We ran three difference forest-themed education stations and did our best to keep up with the huge number of excited learners. Huge thanks to Tony and Alan for their help! Also in May, Danielle from Literacy Link moved on to start a new degree and was replaced by the ever-supportive Herta. Tony and Herta became an unstoppable duo that made the rest of 2014 an absolute delight. As part of the Humanities Matter Webseries, the organizers of the Congress of the Social Sciences and Humanities (the largest academic gathering of its kind in Canada) invited us to Brock University for a five-day visit. We brought the MakerBus and our tech and conducted five days worth of interviews with professors, graduates students, and librarians. We even had the president of the Social Science Humanities Research Council (SSHRC) sign our bus! Huge thanks to Brian for showing us around St Catherines. We’re going to leave off here, because the second half of 2014 was so awesome it needs it’s own blog post. Stay tuned for travel, summer camps, fairs, and Make-a-thons.